Infotoxology | Infotoxology – when too much info becomes toxic! Feedback and Peer Review: It’s a gift! I always look at feedback as a gift. In like fashion, when I am asked to provide feedback, I take that responsibility seriously. The person who is working on a project is taking that project seriously and they deserve to have equal and fair effort by others who provide peer review and feedback. As I reflect on the feedback that I received from my instructor and my peers, I can see the value of perspective. Having feedback from others can be very good if they take the time to really understand what is presented and mindfully share their point of view. For example, I got instructor feedback that suggested any original thought or idea needed to be cited and referenced to ensure that it was either valid or supported by others. I question that philosophy, but understand now why it is important to make sure to assign credit and support for your ideas. Peer feedback is very important highly valued. I am not a teacher from the academia environment, so getting feedback from those who are proficient and skilled in academia is quite valuable to me. I try to understand the perspective and incorporate it into my business perspective to see how I can make adjustments. In general, I agree with most feedback in the sense that it is presented as a form of social constructivism. The feedback has all been formative. It is an on-going cycle of getting insights and opinions as they are needed instead of finding out at the end of the class that you could have made improvement. Formative has immediate value and is very timely and is always preferred. Summative feedback has its place in forward thinking strategy but formative has the advantage of being real-time and tactical. When I disagree, I always ask myself why I disagree and then challenge those premises to see if I need to re-think my position. Sometimes the feedback is ill founded and not supported, so it not accepted and usually left behind without a strong argument, unless the source is willing to discuss in more detail. I consider myself an expert in several domains. However when it comes to be competent as a teacher I consider myself to be more of an apprentice. Therefore, most of the time I welcome and respect and accept feedback without even questioning the value of it. I take it as a gift and learn from it quickly. Examples can be trivial like following the APA guidelines correctly and not having two spaces after a period or more sophisticated like missing the story telling schema required in a literature review. However, if I disagree with feedback and feel that I have a strong and differing opinion I will not hesitate to go deeper into discussion on the topic in order to better understand the differences. A good example of that might be in resolving the operational definition and perspective of what it means by “open source” tools, etc. The nice thing about theory is the ability to add on and change and modify based on feedback. Einstein’s theory of relativity has been expanded with new knowledge and improved. My person learning theory is based on a constructivist approach. I know how I learn and it is an accumulative process, building on my previous knowledge. Others have been able to relate to the common theme of this theory and help change it in a more realistic model that I can internalize and grow. It is important to know that feedback is a gift. You might event want to think of feedback and peer review as part of a continuous improvement process. Some might even call it quality control to a certain degree. Any process can be improved. In the world of six sigma – the process is to define, measure, analyze, improve and control. When it comes to research or just writing in general, it is good for others to evaluate your work. The goodness comes in terms of perspective and clarity. As you write, sometimes your thoughts are closely held within your mind and it is perfectly clear with your personal reference. Others however may see your message from an entirely different perspective and be able to provide clarifying feedback that will improve the overall content of your study or paper. We are all influenced with feedback. When we question ourselves that is even a form of direct feedback. Why did I do this or do that? I go back to the foundational definition of constructivism and that allows be to build it out according to my own personal experiences. When new technology is introduced, I always ask how I can use it to learn better. That is part of the evolution of learning theories. They do not stay constant. The good news is this – errors will be eliminated, additions will be suggested and deletions will be advocated. 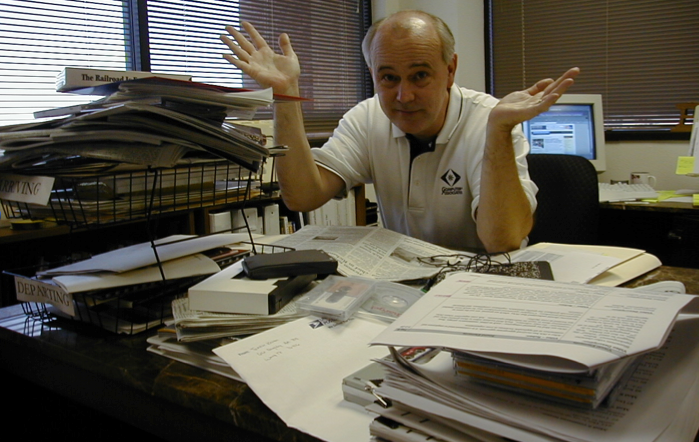 As the author you have total control over your document, but the insights of others is usually well received. NASA has a test that they give new astronauts. The test sets the stage in a hypothetical crash landing on the moon where you have twenty items to help you survive. You are asked to arrange the twenty items in terms of the most important to the least important. As an individual you perform this test by yourself and you are scored. The same test is then given to a team of five who are asked to work together to do the same test they did on their own. Every single team always outperforms the individual. That is the power of collective thinking and collaborative feedback. 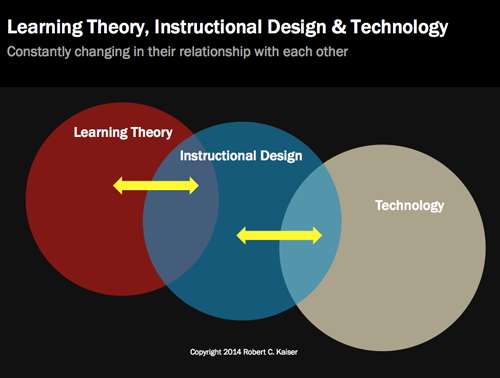 Research Methods, Learning Theory & Instructional Design – the trifecta! I am looking for your personal reflection here. Were you intentional in your decisions? What steps were determined easily and which steps were more difficult to take? I like the concept of action research for it allows you to try a variety of assessments before you go to far down a path and then find out it may be a dead end. There is a natural order to making instructional design decisions. I always look at the learner and try to establish their base of knowledge. I want them to grow from that point forward. I feel that too often assumptions are made that are not valid about the learners experience and knowledge. It is worth the time to form a focus group and learn more. After that I want to know what my options are for delivery. Will online work or do I need to take a blended approach. The next step is to really assess how much information is going to be created and how can it be arranged for easy access and formative feedback. How hard is it to develop a research method that both matches your theory and created curriculum? A research method is just a process used to answer a research question. There are many different research methods. Just to name a few, correlational, experimental, quasi-experiment, longitudinal, cross-sectional, single subject, design experiments, etc. Then you can mix and combine these to form even more. So the hard thing is to determine what method or combination of methods will serve your time and resources that you have available. Research can get very complicated very quickly if the wrong decisions have been made. The theory and the instructional design does not always require a research project. If you have a new theory or approach and you want to see if it is going to be effective, then a research project might be in order. What was simple and what was difficult? From a social constructivist approach using an instructional design format from 5E was an easy decision and even easier to implement using Canvas. Thinking through the many possibilities listed above could be a difficult task, since each one would have to be analyzed for suitability. Narrowing the choice if done correctly can be very difficult due to the selection criteria. The topic for discussion relates learning theory and instructional design and research methods. As always, lets start with learning theory. The highest level for this discussion is a constructivist theory which simply indicates that learning depends on what we already know and what we can already do and then to build upon that foundation. 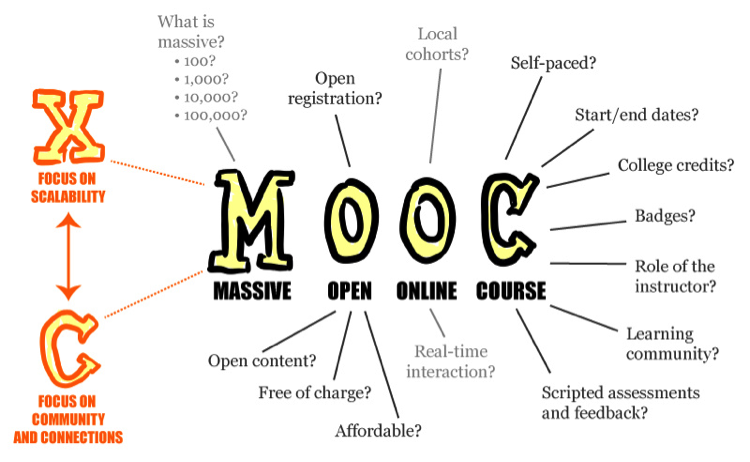 This theory was applied to an online environment using a learning management system (Canvas), which incorporated an instructional design methodology known as 5E Model. It starts with ENGAGE and moves to EXPLORE, then EXPLAIN, then EXTEND or ELABORATE and then EVALUATE. There are behavior expectations with this approach from both the teacher and the student. The question becomes, how can we research to see if these behaviors actually took place. To be specific, from the learner’s behavior associated with the ENGAGE portion of the model might involve being attentive in listening and asking questions that show an interest in the lesson. It might also involve responding to questions that are presented (or not responding to questions). This level of questioning might demonstrate their personal entry point of understanding. The same evaluation of behavior can be provided for the teacher. Keep in mind that each section of the 5E’s has specific concepts and attributes that establish the expected behavior for both the student and the teacher. With a foundation of expected behaviors being identified and understood, the next step is to review a potential research method to see if the 5E instructional model actually worked with the intended audience. Research methods at a high level would include quantitative and qualitative approaches. 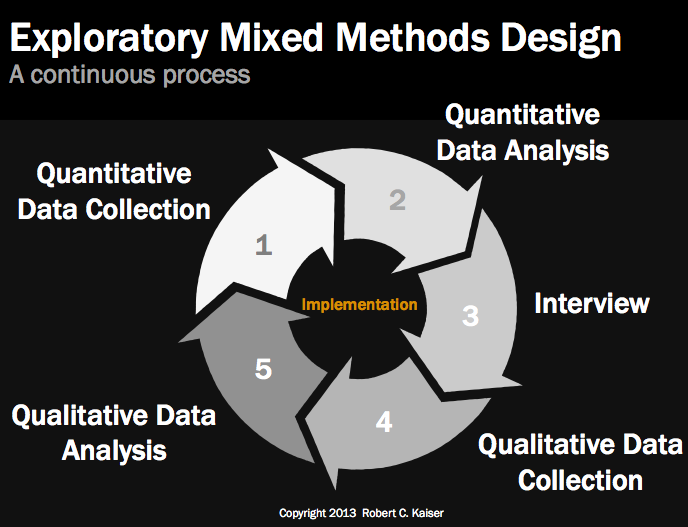 For this research project associated with online learning, a mixed method approach would provide both quantitative and qualitative evaluation. Refer to the diagram below that shows the continuous process used. The research could include a survey instrument and a semi-structured interview protocol. Starting with a quantitative data collection and data analysis from a survey and then followed with interviews of the students and teachers. Qualitative data analysis can take place using the constant comparative procedure and then identifying, coding and categorizing patterns found within the data. This can become a very extensive research initiative, but if properly implemented could verify the value of the 5E learning model. To answer the question regarding the research method, it is not hard to select a method, but to employ a thorough research initiative is not an easy assignment. It requires established a good research question and a course of action that can provide reasonable outcomes that can receive peer review and further improvements.